New strategies for the safety of plants and machines must take into account both security (IT security) and also safety (machinery safety). Pilz shows how this is possible in the “Security” white paper. Ultimately, safe operation in the Smart Factory is only guaranteed when the relevant data are reliably transferred. The old saying is true: Safety measures must not impair the productivity of plant and machinery. That calls for a holistic approach to safety & security. 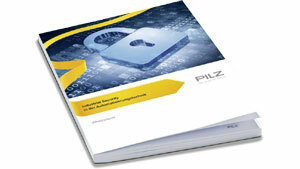 In the “Security” white paper, experts from Pilz have compiled central aspects of security and introduce solution approaches for practical applications. As a result, machine builders, plant designers, installation engineers,maintenance engineers and so on can recognise what role their products or services play in the security strategies of their customers and what they must pay attention to.